My last trip took me from Vancouver, BC to Las Vegas, Nevada. I hopped on friendly Westjet and my first stop was in Vancouver where I spoke at the TriBC Athlete Gala. The gala is a fundraiser to support youth development in British Columbia so it was an amazing opportunity. The event itself raised $10,000 for youth development and by speaking I was able to donate $500 to the Victoria chapter of Kidsport. I was so happy to be presented the chance to do something for the youngsters that I train with so I flew out of Vancouver on a high. It was a great night and thank you to all the folks that organized and attended. I love nights where everyone dresses up, haha! I have always been a bit of a magpie for cute outfits. Thanks to Blueseventy, USANA and Champion System for helping me to donate to the silent auction that night! The 2015 edition of Challenge Penticton was both a great success and a fresh start for this iconic race. It appears that during the last three years the event has been trying to find a new identity moving forward and this year the race started to realize its new potential. 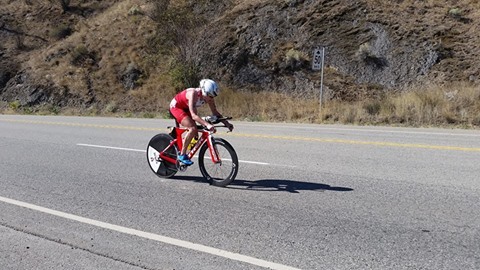 It was announced that in the future Challenge Penticton will be one distance, 3km/120km/30km and will become a qualifier for the ITU Long Distance Triathlon World Championship. I applaud this new direction and I commend both Michael Brown and Kevin Cutjar for having great expertise, insight and ability in creating this new direction. Challenge racing is amazing: the pre-race dinner, the family atmosphere, the party at the finish line and the community involvement makes these events special. I also loved what is uniquely Penticton: the iconic race course, the stunning scenery, the amazing volunteers (many who come out every year) and the new stadium finish line. It was my first time experiencing long course racing in Penticton and I appreciate so much the wonderful people I met on this trip! I did lead the race from 20km and set the fastest bike split. Unfortunately, my race was not all that I had hoped for as it was marred by a penalty due to a pro male while I was leading the race and ended with DNF. The woman at the top on race day were no strangers to the podium and put on a great display of strength. I am so pleased for Jen Spieldenner, Carrie Lester and Heather Lendway for earning the top paychecks on the day. Special mention goes to Canadian superstar runner Malindi Elmore for earning the top Canadian woman’s position with her superlative running ability. The men’s race was a who’s who of amazing Canadian talent with Brent McMahon winning the race, Trevor Wurtele taking second and Jeff Symonds taking fourth after a flat. Chapeau boys! What a super field of professionals with 45 of us in total making the trip to Penticton. The great panel assembled at Challenge Penticton with Kevin (Race Director), Zibi (Challenge CEO), Ellie, Laura, Chris, myself, Brent, Trevor, Miki, Jeff, Kate and Carrie. My weekend staying with Alan Kidd and his wife Gwyneth was so great. Alan is very knowledgeable about triathlon so sharing stories about the race was fantastic. Okanagan Lake was beautiful for swimming in my fabulous Blue Seventy wetsuit and the rolling hills were fun to take my Trek Speed Concept out for a gallop on that beautiful bike course that I enjoyed pouring some effort into. Yves and Anne from Asics Canada were on hand sharing the Asics love and I will enjoy trying out the new 33-M shoe on the trails. Any fears of fire related air quality were fortunately resolved by a timely shift to rainy, cooler weather and the day was beautiful. I did have some problems getting to Penticton because of the fires as my plane on Friday flew all the way to Penticton before turning and flying back to Vancouver without landing. I was told no flights would land so along with three other women I hopped in a rental car to Kelowna to make it that day. Nothing like some quick organization amongst four motivated women to fix a problem. Thank you to Genevieve, Kirsten and Gwen!! A broken toe on Thursday (random slip and smash into the couch), a botched flight on Friday and a penalty on Sunday means I have weathered this storm and it is time for things to come right again for the next race. Cheering on the full distance racers on the run course and at the finish line at midnight was a highlight. It was a great experience and it renewed my admiration for the Challenge style event. These events are top quality with all of the character of a grass roots event. This will certainly not be my last Challenge. Thanks very much to Kevin and Mike for inviting me to the Challenge Penticton race. It was great to see the Challenge St Andrews organizers Tressa and Scott there with the family to cheer Scott to the finish line as well. Thank you to all of the amazing women pros who came to Canada to make this event so impressive with such a large field. Thank you to my friends and family for coming to cheer! Thanks Trek, Bontrager, Shimano, Blueseventy, Rudy Project NA, Champion System, Asics Canada, Frontrunners Victoria, Powertap, USANA and Powerbar. I did ride another fastest bike split so I am recovering well from Ironman Canada and I look forward to another day at the races at 70.3 Silverman! The Challenge event in St Andrews did not disappoint as #myfirstChallenge, a hashtag devoted to those trying this brand of middle and full distance triathlon races around the world for the first time. Although I have a bucketload of half distance triathlon finishes, I have never participated in a Challenge Family event but after this race it will not be my last. The race was held as far across Canada as I could go. Please consult this map to see where I went. However, flying out of Victoria and then in to Saint John it looked almost like we had turned around… only the trees were different J St Andrews on the Sea is kind of like cruising through Oak Bay.. if you are from Victoria. Green is Victoria- Blue is St Andrews. Anybody coming from mountain bike racing or XTERRA would feel right at home at these events. It has all the infrastructure and organization of a top notch professional event but it still remains relaxed and inclusive. All of the energy, friendliness, and beauty in Challenge St Andrews has to be experienced before you scoff at the superlatives. It was simply an amazing and special event. For a town of 1500 to hold a race of this size is amazing. I think long after my pro career has finished someone is going to talk about missing racing Challenge St Andrews because it sold out in 15 seconds and I will be that wrinkled up old leatherback saying, “Yeah? I raced that back in ’15. I remember a salt water lake and some fireman who ran around the course with a 35 pound air tank.” Memories, thanks for that Fireman Rob. I keep saying that a professional career has to be fun outside of winning and I can’t stress enough to age group athletes that it is even more important to have that perspective when you balance racing with life. This is all about having fun. It is hard to balance a relationship, a family, a career and your goals if you don’t enjoy every minute of time in your life you have devoted to pursuing your goals. It isn’t just about winning or a personal best.. it is about experiencing life with passion and inspiration. Make it count and make it memorable. Events like this create the memories that last longer than your results and I appreciate that at this point in my career more than ever. Having the opportunity to race at a stunning tourist destination, with the most welcoming hosts and an entire race field full of smiling faces was just such a pleasure. Thank you so much for inviting me. It was so special. On behalf of the pros I want to extend another huge thank you to all of the volunteers who put so much time into this race. I recognize that it is not a big place and a lot of people came “from away” to make the race happen. We can’t be professionals without races and we can’t have races without volunteers. I appreciate so much the opportunity that you have presented to all of us. Kind of like running along Dallas Road, no? Winning my first Challenge race doesn’t hurt to make it memorable though. I had my work cut out for me as Kirsten and Jillian really stuck it to me in the first half of the race. I was pleased when my legs came around about halfway on the bike and I started moving to the front and held my lead through the run. It was great to share the podium with Kristin Marchant, Jillian Peterson, Charisa Wernick and Caroline St-Pierre. I would like to throw up a huge high five to Taylor Reid for winning his first ever professional half distance event although this wasn’t really his first win because he did win the men’s race in Saskatoon last year… he just couldn’t beat all of the women J Such a bright future in non- drafting for that guy. Contrary to the race reports, I did not have the fastest swim. The four hour time change meant I was waking up at midnight to race at 3 am so it is lucky I got my Blueseventy on without zipping it up backwards. I was dropped off of good feet to follow about 200m from the start and proceeded to plow my own way through the water to T1. I am 0 for 4 good swims on the East coast now. I am sure my first four week block of real Ironman training didn’t help me leap from the gates either. Exiting the swim I stopped, took off my wetsuit and put on shoes to run the 400 m up the hill because my tootsies are a bit sensitive at the moment. With Ironman in a few weeks I opted for very slow transitions and safety for the feet so I was doling out time like a referee on Burrows. I gave over two minutes to the leaders between the swim and transition before the bike. I need to tighten that up in the next few weeks. On to the bike, the sluggish start continued as my first 45kms was fairly slow and I felt like I wasn’t gaining any time but by about 30kms I could see they were coming back every 14km stretch of the loop at the highway. Spending my weekend with the Tanners was great- Adam Tanner was a gentleman and amazing host to Jillian Peterson and I. What an incredible young man who I want to wish the best of luck in maritime college in Newfoundland. The logistics could not have been much easier, given the entire race venue and course was all organized around the Algonquin Resort which was around the corner from where I was staying. It took me two minutes to get to transition and the same to the swim start, the awards and the pub….all was quite convenient. Thank you so much to Scott and Tressa Bevington for inviting me to their incredible race. Thank you to co-race directors Garth and Helena Miller for everything. Thank you to the town of St Andrews and all of the volunteers for putting on a world class event and inviting the professional field to such a fun and exciting race. Thank you to the RCMP for making the roads safe, thank you to the 100 kids (100!!!) who absolutely lit it up in the kids splash n dash race that made my Saturday so much fun, thank you to the Algonquin Resort and Kingsbrae gardens for the amazing venue, thanks to all of Challenge St Andrews’ sponsors and finally thank you to the pro and amateur field for the fun day at the races. It was a pleasure to share the course with you all. I created this little video so you could get a glimpse of what Challenge St Andrews is all about. I am sure that putting this race in your calendar would be your best decision of 2016. I loved it so, so much. Thanks so much to my sponsors that make this adventure as a triathlon pro a reality: thanks to Trek Bikes, Bontrager, Powertap, Champion System, Rudy Project North America, Shimano Triathlon, Blueseventy, Sci Con Bike Travel Bags, Frontrunners Victoria, Asics, Synergy Wellness, Markus Blumensaat, and Procity Trek Store. I would like to leave you with this quote that I love: “People will forget what you said, people will forget what you did, but people will never forget how you made them feel.” – Maya Angelou. Thank you Challenge St Andrews for how you made me feel this past weekend. I won’t forget it. This year was the 20th anniversary of the Victoria Half Ironman. For 12 years this was a Frontrunners event and they did an incredible job in cementing the history of this event into the community. It is true that it has gone through a few iterations and patently obvious that Ironman taking over the event improved its reach. This year there were more than 1900 participants in a sell-out event. Incredible! I have never participated in this race to date and it has always been on the “bucket list” to tick off so racing the course was important to me. I would have preferred to have a pro division to compete against but this year Ironman did not choose to put a pro prize purse on this race. This was unfortunate for all of the local Victoria pros but I still wanted to use the race for training. The one weakness to training for triathlon in Victoria is opportunity to ride in aero position for long periods of time – there are no long roads without stop signs or traffic lights. Since I am building up to the Challenge St Andrews event on July 5 followed by Ironman Canada on July 26, I came up with a race-training plan with Kelly (www.livefitcoaching.com) that included a solid swim and bike with a run where I would test my “dream” IM Canada pace for 21kms. 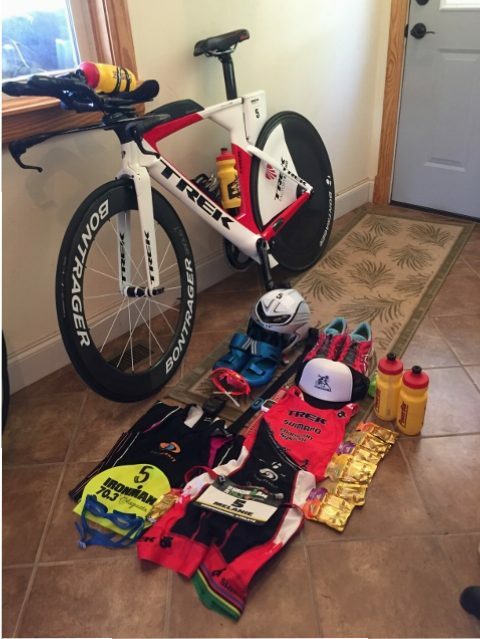 I was also testing a change in nutrition for both the bike and run to reflect what I will do on an Ironman race day… so I did the run with a Fuelbelt loaded up with goodies (I don’t use a belt in the half distance normally). I also tested riding my Trek Speed Concept with a more aero drink holding setup because who doesn’t want an extra 5-10 Watts savings in drag over 180kms? I am riding very well at the moment so I want to maximize this strength for sure. It was a lot easier to go that hard with 2000 super stoked triathletes than by myself so thank you Heather, Keats and Rebecca for your help getting registered, thank you for the amazing athletes for motivating me and thanks to all the amazing volunteers and spectators. Nice to get a chance to poke my nose out at the very front of the race for a while too-rarely happens for us chicks (except in Saskatoon last year – love Canadian races!) I had a great time swimming, biking and running after rolling out of my own bed. This race absolutely killed it for race vibe. It is very hard racing doing the half distance no matter what pace you are going at so congratulations to all the finishers. I hope you all achieved your goals! However, Ironman can we please have a pro race next year?? The only downer is I did NOT get a hoodie. Sold out. I am very sad. Hoodies are part of the tradition. Ironman can you please do that for this race as well? We love our traditions. I was happy to see none other than Bob Saunders of Saunders Subaru at the finishing tape. Subaru was title sponsor of this race and Bob and his family do so much for sport in Canada and in Victoria we have a lot to be thankful for because of them. Great to get that finish line hug. Thanks to Synergy Wellness, Procity Racing and Frontrunners Victoria, three local businesses that help me with my health, my bikes and my feet- and help so many of Victoria’s incredible athlete community keep pushing the limit. Also thank you to Markus at Left Coast health.. another go to therapist I depend on! Thanks to my sponsors Trek, Bontrager, Champion System, Shimano, Rudy Project, Blueseventy, Powertap, Sci Con Bags, Asics and USANA. Another entry into the training diary as I collect some knowledge and experience for my first full distance race! 2015 was the second year I chose to race in Raleigh. Now that the race is done the event went better than my first go at the race despite a less impressive placing. Such is the nature of the 70.3 series this year. It is not often the women’s field is not packed with fast girls. Less races makes for more competitive races and this weekend was no exception. Meredith Kessler, Lauren Barnett and Cait Snow took the top steps with super awesome races. Meredith was consistently solid all around, Lauren put together the best bike/run combo and Cait lit up the run course to pick her way up to the top steps. Three different but very effective approaches. My race started with a terrible swim (same as 2013). Not sure why as I believe I am a very good non wetsuit swimmer. However I was immediately and decisively dropped and lost four minutes right off the bat. Yikes. Then I got on the bike and hammered. I was out of the water pretty much with Lauren so she and I ended up riding the bike together. We rode ourselves up to fourth/fifth and at 10 miles on the run I thought I was going to catch Holly Lawrence and take third. However the wheels came off on the way back to town, I never made up another inch on Holly and lost four more places as the top run splits came flying by. I didn’t need to have a fast run for third… I needed to not die. Despite a controlled bike and a very conservative and controlled first lap on the run I still fell apart in the closing miles. I have a real hate relationship with south east heat as this has happened many times before (including 2013 edition of this race). It puzzles/frustrates/crushes me every time. 1. 1. Rode fast. Turns out three other girls rode as fast if not a few seconds faster. Still gave myself a chance to get top 3 with that bike split despite my crap swim. 2. 2. Bike arrived safe and sound with little effort on my part: the SciCon travel bag really is amazing. I also rode safely from T1 to T2 thanks to some fancy new Bontrager Tubulars aboard my Bontrager wheels. 2015 is a tubular season from now on. Thanks Mark at Trek race shop! 3. 3. Awesome homestay: Alan and Helen took such good care of me before, during (they in the awesome mile 7 feed zone on the run) and after the race. I chose to come to this race 100% because I knew I could stay with them. 4. 4. I am fit – there were just much faster girls on the day this weekend. Despite dying on the run I really don’t think it is fitness related. My heart rate was like a flat line. I had the motor to drive the output but hyperthermia shut it down. The swim is a question mark but again I have a fistful of crap East coast swim splits to compare to. I am pretty sure despite my desperate attempts to be on the time zone arriving four days out I just don’t get going until the bike when the races start at 6:30 or 7am EST. Solution: arrive sooner? Since I still to date have never had a race in the Eastern time zone I am satisfied with I think I should not expect to race well in humidity on the East coast without a minimum 10 day acclimation similar to altitude. Even with good form I consistently fail in the heat and humidity on the East coast… but I have had good races in the heat and humidity in Hawaii. The southeastern oven cooks me every single time and I am not stoked about that. If I need to race East I think I need to go early. That’s pretty much it. I don’t have anything negative to say other than I am not satisfied with 2/3rds of my execution and as a result I would approach this race differently if I did it over again. That has to be balanced with the fact it was a race to get a race in so donating that long to acclimation/race preparation rather than training would have been a trade-off that this year I chose not to make. I can’t be all that upset just realistic: the races are SO competitive that if you want to be there you need to be firing 100%. I was fast for a lot of the race but six girls were faster in the end. Thanks so much to Trek, Shimano, Powertap, Bontrager and Sci Con Bags for providing and protecting this beauty for race day. Thanks to Blueseventy for a sweet swimskin and goggles that I enjoyed wearing for a little too long on race morning. Thanks Champion System for keeping me comfy and cute in my race kit and Rudy Project for protecting my noggin and eyeballs from bike start to run finish. Thanks to Frontrunners Victoria and Asics Canada for comfy kicks out on the run course and USANA for keeping me healthy. Thanks to Kelly at Livefit coaching for helping me prepare and focus on the main goals, find the positive and put the negative in perspective and then the rearview. It is such a pleasure to race with such fast girls. Congrats again to Meredith, Lauren and Cait, the three podium ladies, and congrats to Alexandra, Jacky and Holly for 4th to 6th and Jen in 8th. Top 8 is dollars ladies!! Woohoo! You are all incredibly strong and it is so motivating to keep working hard to try to win another one of these races. It is so great to be inspired to better your best. Thank you for the fuel.